Indoor & Outdoor Sports Complexes! Sorry, no pets are allowed anywhere on the premises. Take Rt. 128 or I-95 to Masspike/I90 West. Take exit 11A to merge onto I-495 N towards NH-Maine. Take exit 23C, Simarano Drive exit (just after route 9 exits on border of Marlboro and Southboro) and turn right at end of ramp onto Simarano Drive. Follow to first traffic light and turn right onto Forest St. Go less than a quarter of mile and Fore Kicks Marlboro complex will be on your left hand side. Take I-95 north to I-495 North. Follow I-495 to exit 23C, Simarano Drive (just after route 9 exits on border of Marlboro and Southboro). Take exit 23C, Simarano Drive exit and bear right at end of ramp onto Simarano Drive. Follow to first traffic light and turn right onto Forest St. Go less than a quarter of mile and Fore Kicks Marlboro complex will be on your left hand side. Take I-84 east to Masspike/I90 east. Take exit 11A to merge onto I-495 N towards NH-Maine. Take I-495 North to exit 23C, Simarano Drive exit(just after route 9 exits on border of Marlboro and Southboro) and turn right at end of ramp onto Simarano Drive. Follow to first traffic light and turn right onto Forest St. Go less than a quarter of mile and Fore Kicks Marlboro complex will be on your left hand side. Take I-495 South to exit 23C, Simarano Drive (just after route 20 exit on border of Marlboro and Southboro). Take exit 23C, Simarano Drive exit and turn right at end of ramp onto Simarano Drive. Follow to first traffic light and turn right onto Forest St. Go less than a quarter of mile and Fore Kicks Marlboro complex will be on your left hand side. 135,000 Sq. Ft. Indoor Sports Megaplex Building! Featuring 7 indoor sport fields on 3 different surfaces including state of the art synthetic grass turf, artificial non-rubber infill turf surface and olympic quality Taraflex gymcourt/futsal courts. Multiple sports including indoor golf driving range, boarded and un-boarded soccer, Futsal, lacrosse, field hockey, basketball, volleyball, golf, flag football, ultimate frisbee, baseball, softball and more. All fields are Fully Air Conditioned for year round comfort! New for our Marlboro facility is our state of the art OUTDOOR sports complex complete with two fully lighted synthetic grass turf 115ydsx65yds fields lined for soccer, field hockey, and lacrosse. Fields also lined for 2-8v8 soccer fields or 4-6v6 soccer fields for ultimate flexibility in game play and training needs. 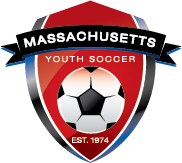 State of the art Musco lighting system, synthetic grass, scoreboards, player and spectator seating, restroom and concession facilities makes this complex one of the finest outdoor sports venue in New England. Including FREE WIFI Internet throughout facility, Elevated Spectator's Observation Lounge, Large Screen Televisions throughout facility and private player showers and lockers. The convenience of our own onsite, fully stocked athletic store featuring quality golf, soccer and lacrosse equipment, accessories and footwear at competitive prices. Our new Cardio and Strength Fitness Center now open in Marlboro. Featureing a full line of top of the line strength machines and cardio equipment including the new Arc Trainers plus Smith Machine and free weights area. Including air conditioned elevated players lounge and observation deck, fully catered banquet and function rooms for up to 300 people, our "Snack Shack" for refreshments on the go, plus our "10th Hole" restaurant eating area featuring favorite fast foods (pizza, sandwiches, french fries, etc), drinks and snacks. Available for birthday parties, teams, companies, organizations and groups for various functions and corporate events up to 300 people. Over 5000 sq.ft. of air conditioned function room space is available plus multiple meeting rooms. Full catering service, and other amenities are available. Click Here Special Events information. Click Here for Birthday Party Specials. Featuring state of the art instruction, and clinics covering multiple sports and programs including golf, soccer, field hockey, lacrosse, football, basketball, volleyball, baseball/softball, personal fitness, personal health and wellness programs and more. Fore Kicks's nationally acclaimed Lil Kickers program and Lil Sluggers program, along wirh pur Hoopla (bball) and Stickler (lacrosse) programs are ideal to introduce and develop children 1.5 yers through 8 years old. 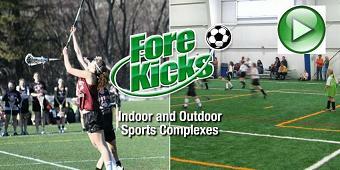 MYSA Approved and SRI Sanctioned Indoor Facility!